Synopsis: Ed Zimmer is a reclusive, New York City tour guide who suffers from recurring nightmares. The haunting premonitions force him to take violent action against the perceived threats all around him, as he attempts to maintain a relationship with a Russian tourist named Lucya, who just might be the girl of his dreams. Jeremy Carr’s mesmerizing debut film is a dark character study that evokes Taxi Driver and other 1970s American films. 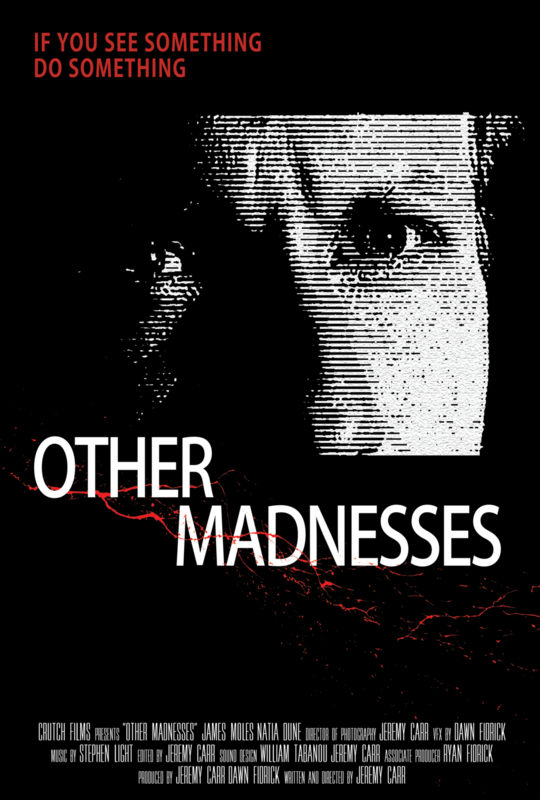 Filmmaker bio: JEREMY CARR makes his feature film debut with OTHER MADNESSES, a psychological thriller that was made with support from The New York IFP. His awardwinning short films include NUCLEAR WINTER, THE DIRTIEST RACKET IN TOWN and ICE CREAM ANTS (featuring Marcus Ashley and Tom Noonan). He also directed the official music video PULLING YOUR INSIDES OUT from Jill Tracy's highly acclaimed album Diabolical Streak. Jeremy was editor of the 2012 Emmy Award-winning primetime TV Special, SESAME STREET: GROWING HOPE AGAINST HUNGER, the short film SELFIE (which premiered at The 2014 Sundance Film Festival and was the winner of a CLIO Image Award), and the upcoming documentary INDIGESTIBLE, which examines the effects of factory farmed animals on the environment and human health. Jeremy produced the feature length documentary THE WAR ON KIDS, which the New York Times described as “A shocking chronicle of institutional dysfunction." It can be viewed on The Documentary Channel and Netflix. He is a graduate of the film program at Boston University and is a recurring guest lecturer at The University of Southern California.